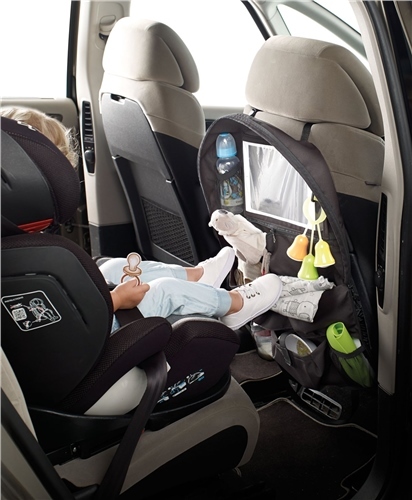 Ideal for organising all the toys and accessories you need for your child in the car. With a special compartment for your tablet and a cover so the sun doesn’t shine on the screen. Folding, with a carrying handle and side zips so you can carry it closed without losing anything. Full of different and practical pockets for perfect organisation. Know exactly where everything is, all the time. Guards your vehicles seat back against dirt, your sanity, against boredom and your journey against constant stops! Installs in seconds and keeps everything your child needs in easy reach - now keeping your child happy & busy in the car is easier than ever before! STOPS THE NUMBER 1 CAUSE OF CAR ACCIDENTS - BE SAFE: Distracted driving is the main cause of car accidents. There's nothing more distracting than turning your head to hand your child something they need. This backseat car organiser is a SIMPLE, SAFE, and SMART MOVE that you can make to keep your little one happy, and your eyes safely on the road. Just clip, adjust & go! UNIVERSAL FIT - DESIGNED TO FIT ALL CAR SEATS AND PORTABLE SCREENS - EXTRA LARGE touch compatible window will SECURE & PROTECT iPads, tablets or portable DVD players so your child never drops it and you never need to stop to clean a sticky screen again! Transportable - Organiser is easily removed, zipped closed and carried with baby from car to car. Complete with a handy storage pocket to keep wipes, toys and any other little essential items neatly organised and easy to find during your trip. Protect the upholstery of your car for longer. Easily attaches to your vehicles seat back.